Taster trays are the way to go. You might want to get a good night’s sleep tonight, because you’ll need all the stamina you can muster if you are planning on taking advantage of all the beery options in the Seattle area tomorrow. While many local breweries will be opening their doors for the WA Beer Open House, Beveridge Place Pub will be kicking off their 10th Annual Barleywine Bacchanal when they open at noon. The Bacchanal celebrates one of my favorite beer styles over a week-long period (through Sat, March 3) where they will rotate a ridiculous amount of great beer through twenty-four taps dedicated to barleywine. 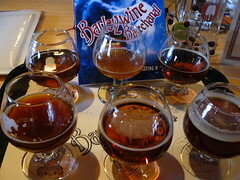 I enjoy barleywines in part because of the range of flavors you can get from the style. Traditional English-style barleywines are focused on the malt flavors, while many American-style examples ramp up the IBUs and focus on the hop profile. You’ll find barleywines that take both avenues to the extreme, but the best examples are balanced and smooth. Due to the high alcohol content (average ABV of around 9% probably), most barleywines age quite well. Beveridge Place will feature multiple vintages of several barleywines that they will pour at the same time so that you can taste a vertical and see how the beer has progressed over time. I highly suggest this. While barleywines can still taste great after even five years or more, I find that most hit their sweet spot after a couple of years of aging. So, I’ll be looking forward to some of the ’10 and ’09 vintage brews. Following is a preliminary list of what will be available. Note that not all of these will be on at once, but that they will be spread throughout the week. Very excited to see the Big Al and Snuggle Bunny introduced. My 6th Bacchanal. I have been sniffing out the Big Al since I first heard they were brewing it up early last year. Curious to know what the Final G and grain bill is on the Snuggle Bunny. Yeah, I’m especially excited for the Big Al. Had a chance to try one of his homebrew Barleywines a few years back and it was outstanding.